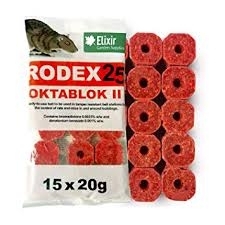 Rodex Mouse Poison Bait Blocks 45 x 20g are effective, easy to use mice bait blocks suitable for use indoors or outside. As these are multi-feed blocks, where the mouse baits are taken, they should be replaced with new bait blocks until no further bait takes are found. Suitable for both mice and rats, these bait blocks are highly attractive to mice and have an anti mould ingredient to stay fresh even in damp conditions. * Strongest available mouse poison bait. * Use in our Plastic Tamper Resistant Mouse Bait Boxes. Low level of mouse activity use 1 to 2 blocks every 5 metres where there is evidence of mice. High level of mouse activity use 1 to 2 blocks every 2 metres where there is evidence of mice.